Following are magicians who we know have won Merlin Awards based on their listing on the IMS site (or other references as mentioned below), but we have no idea when they won them or what they were for. If you can help, please email Tim@MagicUnlimited.com or leave a comment below. 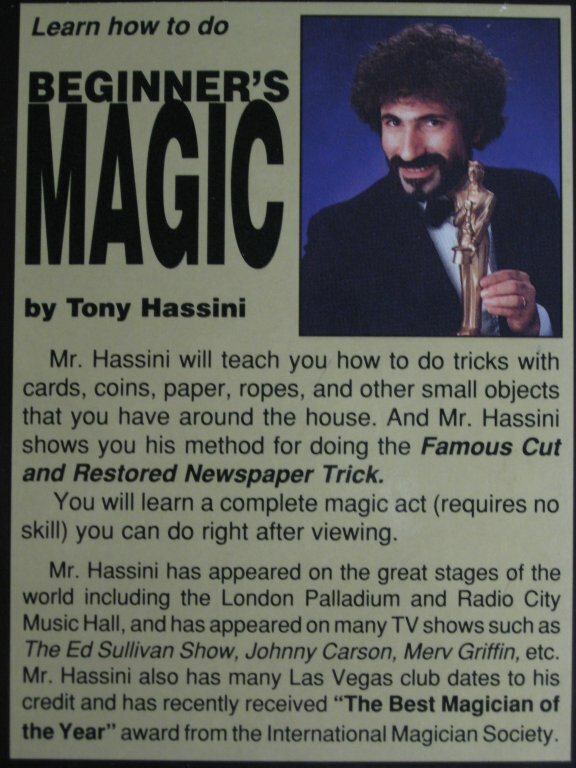 Tony Hassini – ‘Magician of the Year’ (see photo below from the back of one the IMS videotapes) When asked, Tony Hassini was unwilling to reveal the date of the award. I was presented the Merlin Award 2001, The Best Close Up. Hi Tim this is Gay Blackstone… Sorry for the delay getting to you. Looks like the year 2001 award is listed as 2000. All fixed now Bob. Thanks! “Best Magic Festival in China” base on Happy Valley theme park have organize annual Happy Valley International Magic Festival since year 2000, which is a weekly event in every Oct. This year there are 4 locations in China as there are now 4 Happy Valley theme park in the country. Tony also present “Best Female Illusionist in China” to Ms. Ru Xian., who is the only female magician in China with her own illusions show since 2001. Allen Ravine won Merlin Award for Gospel Magician of the year in 2009.